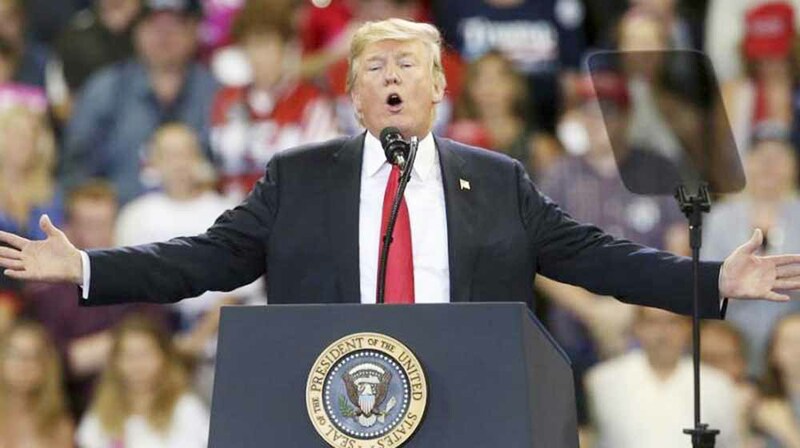 Responding to a series of question on illegal immigration, the President Trump reiterated that he wants people based on merit, a move that can help technology professionals from countries such as India. "I'm very tough at the borders. We've been very tough at the borders. People have to come into our country legally, not illegally. Legally. And I want them to come in on merit," Mr Trump told reporters at the White House on Saturday. "We need people coming in, but we want them to come in on merit. We want people that are going to help us. It's very important," Mr Trump said. "If they feel there will be separation, they don't come," he said of migrants during comments to reporters at the White House. Trump also claimed, without providing evidence, that immigrants were "grabbing children and they're using children to come in to our country in many cases." "We're looking at a lot of different things having to do with illegal immigration," he said, again calling on Congress to pass immigration legislation. "We're going to do whatever we can do to get it slowed down." "DHS will continue to enforce the law humanely, and will continue to examine a range of options to secure our nation's borders," she said. Following reports that Trump might again authorize family separations, Democratic Senator Dianne Feinstein and Representative Jerrold Nadler on Friday called on the administration to "provide a full accounting of their previous failed efforts." A government audit released earlier this month said the Trump administration's "zero tolerance" immigration crackdown at the U.S.-Mexico border earlier this year was plagued by a lack of preparation, resource shortfalls and communication failures.